Body Alignment Lines System – Your Body will Feel Steadier and More Aligned! 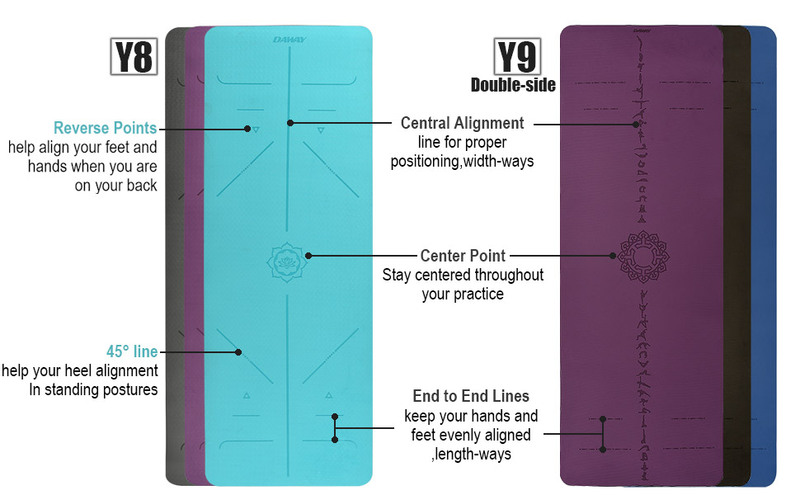 Why Select DAWAY Y8/Y9 TPE Yoga Mat? 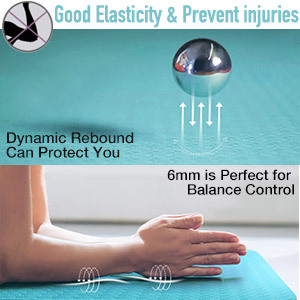 More soft and more comfortable than ordinary yoga mat, better elasticity. 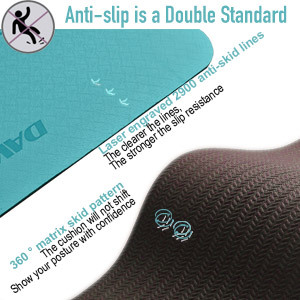 Extra thick 6mm mat protects joints without compromising support or stability. 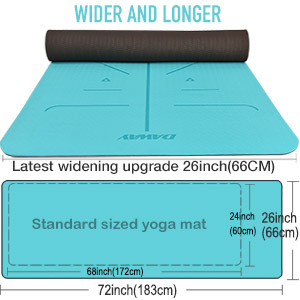 72″ long 26″ wide, longer and wider than regular yoga mats, ensures comfort for people of all shapes and sizes. Offers the most comfortable experience for all level Yogis. Special laser engraving texture on both sides, non-slip index and density higher than ordinary yoga mats. 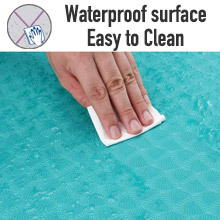 Moisture resistant, easy to clean with soap and water. 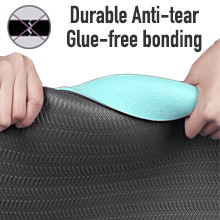 We only use SGS certified TPE material to ensure the best cushioning and slip-resistance at the same time. 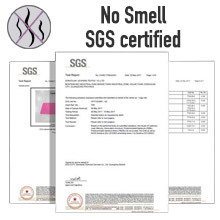 No latex, no PVC, non-toxic and no any harmful chemicals. Get a healthy yoga mat for your lover, families, friends or yourself. 1. The mat may curl if being rolled up for a long time. It would become completely flat after several times of use. 2. To avoid getting the mat deformed, please do not fold the mat for a long time or squash the mat. 1.Put the towel into the washbasin, wet it and wring the towel dry. 2.Wipe the yoga mat with a towel and wipe off the dirt on the yoga mat. 3.Place the yoga mat in a cool, ventilated place to let it dry, keep away from the sun, otherwise the yoga mat will be split. 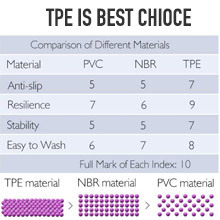 Thermoplastic Elastomers (TPE) are generally low modulus, flexible materials that can be stretched repeatedly providing superior durability, cushioning and slip-resistance.It’s the latest technological improvement to traditional mats.